Ghanaian owned entertainment television channel 4Syte TV has been honoured as the “Music industry Pillar” of the Year at the just ended MUSIGA Presidential Grand Ball. 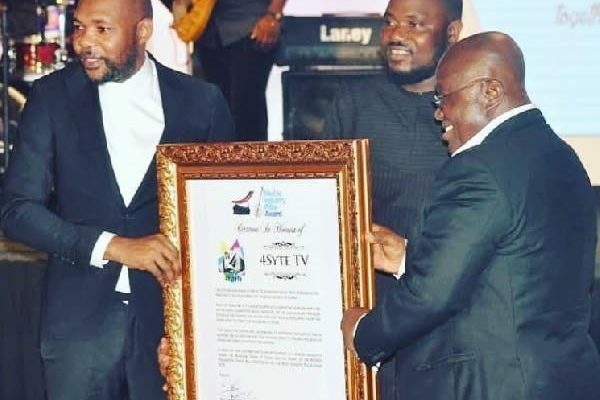 The citation was to acknowledge the immense efforts of 4Syte TV in promoting and improving the face of Ghana’s music industry through music videos, events and more. “I feel so honoured. I am so proud of this award. For MUSIGA to recognize our efforts is really humbling. We are very grateful I would like to use this opportunity to thank the new artistes for believing in the 4syte brand. We couldn't have come this far without you. This award signifies our effort to promote the young artistes. What we deal with is brand identity and recognition in the industry. I am so proud of this award", he said. "For example, there was Agiecoat who used to promote Buk Bak and shot the most expensive video for their Song "Gonga Barracks'. As time went on, all those promoters faded out and there was a rumour that they put such into the business and got nothing back or the artistes disrespected them". "There is an example of a young artiste whose video was rejected because it didn't meet our standard, he was so disappointed. So I offered to shoot a video for him but he rejected it. It hit me so hard so went back to my people and came up with the idea of New Lords where we groom up-and-coming artistes whose videos don't meet our standards.